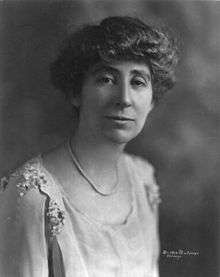 Jeannette Pickering Rankin (June 11, 1880 – May 18, 1973) was the first woman to hold federal office in the United States when, in 1916, she was elected to the U.S. House of Representatives by the state of Montana as a member of the Republican Party. She won a second House term 24 years later, in 1940. Each of Rankin's Congressional terms coincided with initiation of U.S. military intervention in each of the World Wars. A lifelong pacifist, she was one of 50 House members (total of 56 in both chambers) who opposed the war declaration of 1917, and the only member of Congress to vote against declaring war on Japan after the attack on Pearl Harbor in 1941. Rankin was also instrumental in initiating the legislation that eventually became the 19th Constitutional Amendment, granting unrestricted voting rights to women; and she championed the causes of gender equality and civil rights throughout a career that spanned more than six decades. Rankin was born on June 11, 1880 near Missoula, Montana, nine years before the territory became a state, to schoolteacher Olive Pickering and Scottish-Canadian immigrant carpenter and rancher John Rankin. She was the eldest of six children, including five girls (one of whom died in childhood) and one brother, Wellington, who would become the state's attorney general, and later, an associate justice of the Montana Supreme Court. As an adolescent, Rankin cleaned, sewed, and helped care for her younger siblings, in addition to sharing in the outdoor work and daily farm chores. She helped maintain the ranch machinery, and once single-handedly built a wooden sidewalk for a building owned by her father so that it could be rented. Rankin later recorded her childhood observation that while women of the 1890s western frontier labored side by side with the men as equals, they did not have an equal political voice—nor a legal right to vote. Rankin graduated from high school in 1898, and from the University of Montana in 1902 with a Bachelor of Science degree in biology. With no clear career ambitions, she first tried dressmaking in Missoula, and then furniture design in Boston, where she lived while her brother attended Harvard. She also turned down several marriage proposals. At the age of 28, Rankin moved to San Francisco to take a job in social work. Confident that she had found her calling, she enrolled in the New York School of Philanthropy in New York City (later part of Columbia University School of Social Work) from 1908 to 1909. She then moved to Spokane, Washington where, after briefly serving as a social worker, she attended the University of Washington and became involved in the women's suffrage movement. She helped organize the New York Women's Suffrage Party and worked as a lobbyist for the National American Woman Suffrage Association (NAWSA). In November 1910, Washington voters approved an amendment to their state constitution permanently enfranchising women, the fifth state in the Union to do so. In February 1911, Rankin became the first woman to speak before the Montana legislature, making her case for women's suffrage. In November 1914, Montana passed a similar amendment granting women unrestricted voting rights. Rankin later compared her work in the women's suffrage movement to the pacifist foreign policy that defined her congressional career. She believed, with many suffragists of the period, that the corruption and dysfunction of the United States government was a result of a lack of feminine participation. As she said at a disarmament conference in the interwar period, "The peace problem is a woman's problem." Rankin's campaign for one of Montana's two at-large House seats in the congressional election of 1916 was financed and managed by her brother Wellington, an influential member of the Montana Republican Party. The campaign involved traveling long distances to reach the state's widely scattered population. Rankin rallied support at train stations, street corners, potluck suppers on ranches, and remote one-room schoolhouses. She was elected on November 7, by over 7,500 votes, to become the first female member of Congress. Shortly after her term began, Congress was called into an extraordinary April session in response to Germany's declaration of unrestricted submarine warfare on all Atlantic shipping. On April 2, 1917, President Woodrow Wilson, addressing a joint session, asked Congress to "make the world safe for democracy" by declaring war on Germany. After intense debate, the war resolution came to a vote in the House at 3 o'clock in the morning on April 7; Rankin cast one of fifty votes in opposition. "I wish to stand for my country," she said, "but I cannot vote for war." Years later, she would add, "I felt the first time the first woman had a chance to say no to war, she should say it." Although 49 male Representatives—and six Senators—joined her in voting against the declaration, Rankin was singled out for criticism. Some considered her vote to be a discredit to the suffragist movement and to her authority in Congress, but others applauded it, including Alice Paul of the National Woman's Party and Representative Fiorello LaGuardia of New York. On June 8, 1917, the Speculator Mine disaster in Butte left 168 miners dead, and a massive protest strike over working conditions ensued. Rankin intervened, but mining companies refused to meet with her or the miners, and proposed legislation was unsuccessful. By 1918, women had been granted some form of voting rights in about forty states, but Rankin became a driving force in the movement for unrestricted universal enfranchisement. In January 1918 she opened congressional debate on a Constitutional amendment granting universal suffrage to women. The resolution passed in the House and was defeated by the Senate, but in 1919 a similar resolution passed both chambers. After ratification by three-fourths of the states, it became the Nineteenth Amendment to the United States Constitution. During Rankin's term, the Montana state legislature voted to replace the state's two at-large seats with two separate districts, and Rankin found herself in the overwhelmingly Democratic western district. With little chance of retaining her House seat after the reapportionment, she opted to run for the Senate in 1918. After losing the Republican primary to Oscar M. Lanstrum, she accepted the nomination of the National Party, and finished third in the general election behind incumbent Democrat Thomas J. Walsh and Lanstrum. In 1924, Rankin bought a small farm in Georgia where she lived a spartan existence without electricity or plumbing. She made frequent speeches around the country on behalf of the Women's Peace Union and the National Council for the Prevention of War. In 1928 she founded the Georgia Peace Society, which served as headquarters for her pacifism campaign until its demise in 1941, on the eve of World War II. She also worked as a field secretary for the National Consumers League, and as a lobbyist for various pacifist organizations. She argued for the passage of a Constitutional amendment banning child labor, and supported the Sheppard–Towner Act, the first federal social welfare program created explicitly for women and children. The legislation was enacted in 1921 but repealed just eight years later. Rankin won election to the House once again in 1940, at the age of 60, defeating incumbent Jacob Thorkelson, an outspoken antisemite, in the July primary, and former Representative Jerry J. O'Connell in the general election. She was appointed to the Committee on Public Lands and the Committee on Insular Affairs. While members of Congress—and their constituents—had been debating the question of U.S. intervention in World War II for months, the attack on Pearl Harbor on December 7, 1941 galvanized the country and silenced virtually all opposition. On December 8, Rankin was the only member of either house of Congress to vote against the declaration of war on Japan. Hisses could be heard in the gallery as she cast the vote; several colleagues, including Rep. (later Senator) Everett Dirksen, asked her to change it to make the resolution unanimous—or at very least, to abstain—but she refused. "As a woman I can't go to war," she said, "and I refuse to send anyone else." Two days later, a similar war declaration against Germany and Italy came to a vote; Rankin abstained. Her political career effectively over, she did not run for reelection in 1942. Asked years later if she had ever regretted her action, Rankin replied, "Never. If you're against war, you're against war regardless of what happens. It's a wrong method of trying to settle a dispute." Over the next twenty years Rankin traveled the world, frequently visiting India, where she studied the pacifist teachings of Mahatma Gandhi. In the 1960s and 1970s a new generation of pacifists, feminists, and civil rights advocates found inspiration in Rankin, and embraced her efforts in ways that her own generation had not. The Vietnam War mobilized her once again. In January 1968, the Jeannette Rankin Brigade, a coalition of women's peace groups, organized an anti-war march in Washington, D.C.—the largest march by women since the Woman Suffrage Parade of 1913. Rankin led five thousand participants from Union Station to the steps of the Capitol Building, where they presented a peace petition to House Speaker John McCormack. Simultaneously, a splinter group of activists from the women's liberation movement created a protest within the Brigade's protest by staging a "Burial of True Womanhood" at Arlington National Cemetery to draw attention to the passive role allotted to women as wives and mothers. In 1972, Rankin—by then in her nineties—considered mounting a third House campaign to gain a wider audience for her opposition to the Vietnam War, but longstanding throat and heart ailments forced abandonment of that final project. Rankin died on May 18, 1973, age 92, in Carmel, California. She bequeathed her estate, including the property in Watkinsville, Georgia, to help "mature, unemployed women workers". The Jeannette Rankin Foundation (now the Jeannette Rankin Women's Scholarship Fund), a 501(c)(3) nonprofit organization, awards annual educational scholarships to low-income women 35 and older across the United States. Beginning with a single 500-dollar scholarship in 1978, the fund has since awarded more than $1.8 million in scholarships to more than 700 women. A statue of Rankin, inscribed "I Cannot Vote For War", was placed in the United States Capitol's Statuary Hall in 1985. At its dedication, historian Joan Hoff-Wilson called Rankin "one of the most controversial and unique women in Montana and American political history". A replica stands in Montana's capitol building in Helena. Although her legacy rests almost entirely on her pacifism, Rankin told the Montana Constitutional Convention in 1972 that she would have preferred otherwise. "If I am remembered for no other act," she said, "I want to be remembered as the only woman who ever voted to give women the right to vote." Since Rankin's pioneering term, a total of 307 women have served in Congress; 261 in the House, 35 in the Senate, and 11 in both chambers. The current (114th) Congress contains 104 women; 84 in the House and 20 in the Senate, approximately 20% of the total. Rankin remains the only woman ever elected to Congress from Montana. In 2004 peace activist Jeanmarie Simpson produced and starred in the one-woman play A Single Woman, based on the life of Rankin. Simpson baked bread during each performance and distributed it to audience members as the show concluded. She performed the play 263 times over two years in the U.S. and abroad to benefit peace organizations and movements including the Women's International League for Peace and Freedom, the American Civil Liberties Union, and the American Friends Service Committee. Simpson then wrote and starred in a film biography of Rankin, also titled A Single Woman, directed and produced by Kamala Lopez, narrated by Martin Sheen, and featuring music by Joni Mitchell. 1 2 3 4 5 6 7 8 "Jeannette Rankin". Women In Congress. Retrieved January 10, 2013. ↑ Smith (2002), pp. 33–34;38. ↑ Mansch, Scott (November 7, 2016). "Under the Big Sky: Recalling Rankin's legacy". Great Falls Tribune. Retrieved November 19, 2016. ↑ O'Brien (2001), pp. 23–25. 1 2 3 4 5 6 7 Alter (1999), pp. 153–157. ↑ Fiege, Gale (October 4, 2010). "How Washington women won the right to vote". The Herald of Everett, Washington. Retrieved July 27, 2015. ↑ O'Brien (2001), pp. 29–31. ↑ Hoff, Joan. "Who Was Jeannette Rankin". Peace is a Woman's Job. Retrieved January 10, 2013. 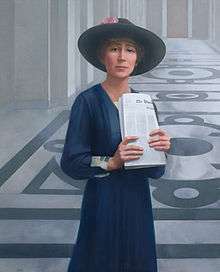 ↑ "National Constitution Center – Centuries of Citizenship – Jeannette Rankin becomes first woman elected to Congress". constitutioncenter.org. Retrieved 2016-08-08. ↑ Shirley (1995), p. 110. ↑ Shirley (1995), pp. 110–111. ↑ O'Brien (2001), pp. 44–45. ↑ O'Brien (2001), pp. 46–47. ↑ Smith (2002), pp. 133–134. ↑ Shirley (1995), p. 114. ↑ Lemons, J. Stanley (1969). "The Sheppard–Towner Act: Progressivism in the 1920s". The Journal of American History. 55 (4): 776–786. doi:10.2307/1900152. JSTOR 1900152. ↑ "Jeannette Rankin returns to House". St. Petersburg Times. November 8, 1940. Retrieved October 5, 2015. 1 2 3 "Jeannette Rankin". 125 Montana Newsmakers. Great Falls Tribune. Retrieved January 10, 2013. ↑ "Miss Rankin is lone dissenter in war vote". Milwaukee Sentinel. December 9, 1941. Retrieved October 5, 2015. ↑ Wyckoff, Whitney Blair (May 18, 2011). "The First Woman In Congress: A Crusader For Peace". NPR. Retrieved October 6, 2015. ↑ Shirley (1995), p. 105. ↑ O'Brien (2001), p. 16. ↑ Shirley (1995), pp. 105–106. ↑ O'Brien (2001), p. 17. ↑ Smith (2002), p. 209. ↑ Moravec, Michelle (2010). "Another Mother for Peace: Reconsidering Maternalist Peace Rhetoric from an Historical Perspective 1967–2007". Journal of the Motherhood Initiative. 1 (1): 9–10. ↑ Shirley (1995), p. 117. ↑ "Jeanette Rankin Women's Scholarship Fund website History & Mission". Jeannette Rankin Women's Scholarship Fund. Retrieved January 10, 2013. ↑ Women in U.S. Congress. Rutgers.edu, retrieved April 27, 2016. ↑ Greenspan, Jesse (November 2, 2016). "7 Things You May Not Know About Jeannette Rankin - History Lists". HISTORY.com. Retrieved November 19, 2016. ↑ "Jeanmarie Simpson: 'Artivist' for Change, Part 2". Retrieved January 9, 2013. ↑ "A Single Woman". Heroica Films, Inc. 2009. Retrieved January 13, 2013. Alter, Judy (1999). Extraordinary Women of the American West. New York: Children's Press. ISBN 9780516209746. O'Brien, Mary Barmeyer (1995). Jeannette Rankin, 1880–1973 : bright star in the big sky. Helena, Mont. : Falcon Press. ISBN 1560442654. Shirley, Gayle C. (1995). More than Petticoats: Remarkable Montana Women (1st ed.). Helena, Mont. : Falcon Press. ISBN 1560443634. Smith, Norma (2002). Jeannette Rankin, America's Conscience. Helena, Mont. : Montana Historical Society Press. ISBN 9780917298790. Giles, Kevin S. (1980). Flight of the Dove, the Story of Jeannette Rankin. [S.l. ]: Lochsa Experience Publishers. ISBN 978-0918688033. Luckowski, Jean A.; Lopach, James J. (2005). Jeannette Rankin a political woman ([Reprint]. ed.). Boulder: University Press of Colorado. ISBN 9780870818127. Josephson, Hannah (1974). First Lady in Congress: Jeannette Rankin. Indianapolis, IN: Bobbs–Merrill. ISBN 0-672-51921-6. Morrison, John; Morrison, Catherine Wright (2003). The Lives and Battles of Montana's Political Legends. Helena: Montana Historical Society Press. ISBN 9780917298936. Murphy, Mary (2015). "When Jeannette said 'No': Montana women's response to World War I" (PDF). Montana: The Magazine of Western History. 65 (1): 3–23. Wilson, Joan Hoff (1980). "'Peace Is a Woman's Job...': Jeannette Rankin and American foreign policy: Her lifework as a pacifist". Montana: The Magazine of Western History. 30 (2): 38–53. JSTOR 4518483. Wikimedia Commons has media related to Jeannette Rankin. United States Congress. "Jeannette Rankin (id: R000055)". Biographical Directory of the United States Congress. Papers, 1879–1976. Schlesinger Library, Radcliffe Institute, Harvard University.